The Promised Neverland is no doubt among the top 10 most anticipated anime Winter 2019 given its original manga’s tremendous popularity. This series possesses a peculiar charm: it looks beautiful and “innocent” at first. But deep down it houses many unexpected dark secrets, making the audience always want to see what will happen next. With the first 3 episodes released, the anime has been received quite positively. And now with no further ado, let’s check out The Promised Neverland first impression! 2. 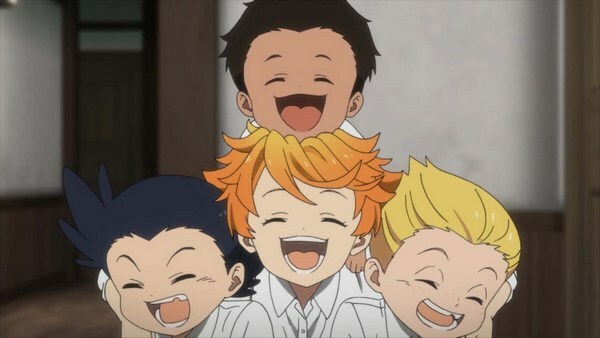 The Promised Neverland Review: Dreamland, or Nightmare? 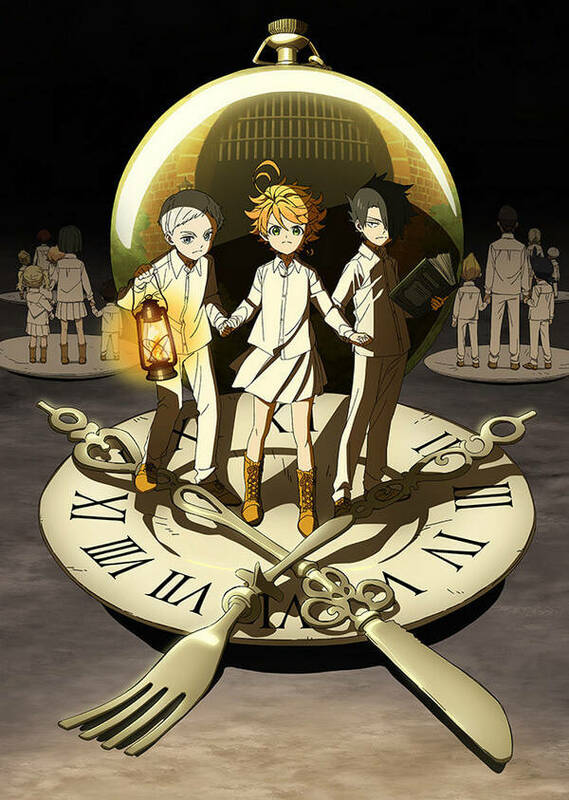 The Promised Neverland (or Yakusoku no Neverland) is originally a manga series written by Kaiu Shirai and illustrated by Posuka Demizu. It started serialization on Weekly Shōnen Jump in 2016 and so far, the series has released 12 volumes as of January 29, 2019. And of course, its anime adaptation has just started this year on January 11. 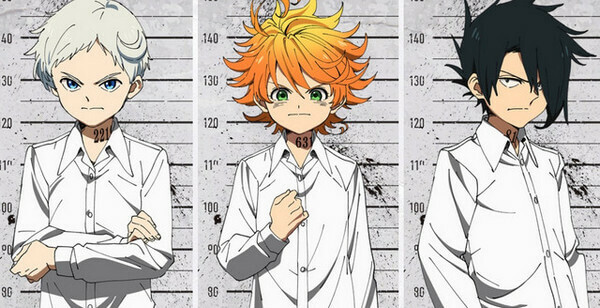 Yakusoku no Neverland’s story begins with a protagonist named Emma, an 11-year-old orphan who lives in Grace Field House – a home of 38 orphans including Emma herself. She, along with her best friends Ray, Norman, and other fellow orphans, has quite a happy life at this orphanage with their caretaker – Mother Isabella. They can do almost whatever they want, except they are forbidden from venturing to the gate which supposedly connects to the outside world. Then one night, an orphan named Conny gets adopted. Emma and Norman notices that Conny forgot her bunny toy and therefore, they followed the trail with hope to return the toy to her. Unfortunately, that is when they discover a horrible truth: Conny was already dead, in fact, she was said to become food for some terrifying demonic creatures. Not only that, they soon finds out that this so-called orphanage they are living is actually “human farm” where human children are being raised to become those creatures’ food. After discovering such painful truth, Emma, Norman, and Ray determine to find out a way out, with hope that they can help every other orphan to escape from this hellish fate. For those who have not read the original manga, this dark plot-twist of The Promised Neverland really caught many people off guard. At the same time, this exact type of plot filled with dark secrets is what lots of viewers are expecting for, thus that explains why this anime has got so high popularity. To certain extent, CloverWorks studio is a relatively new studio and so far, they have quite a decent track-record with several good titles like Fairy Tail Final Series, Darling in the FranXX, and last season’s best romance anime – Seishun Buta Yarou wa Bunny Girl Senpai no Yume wo Minai (or just Seishun Buta Yarou for short). Continuing to The Promised Neverland, it seems that CloverWorks can still keep up with their quality in terms of overall visual. All characters’ design stays relatively faithful to the original manga’s art. 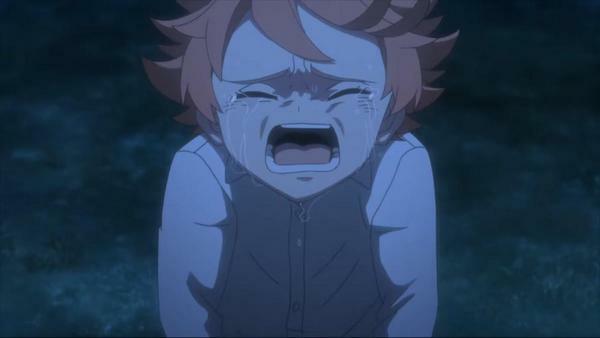 Another plus point for CloverWorks is the character’s emotional portrayal. The characters’ emotion look really convincing, and this is extremely important since the story relies a lot of psychological horror and mind game. Not only that, the voice-acting for each character is also really superb, especially in the first episode when Emma and Norman first discovered the truth of Grace Field House. 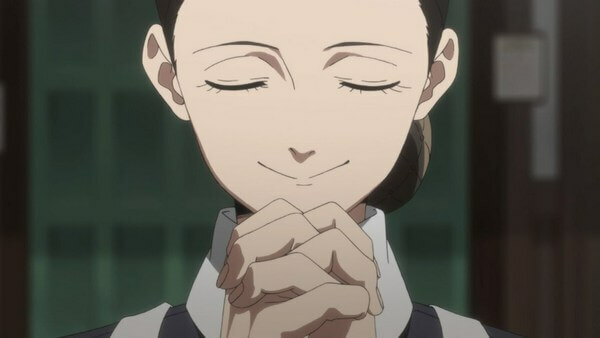 Overall, CloverWorks truly did a justice in terms of visual and sound as they successfully convey the emotions and horror vibe to the viewers. The last thing we have to concern now is how they will deliver the story and characters in this anime adaptation. 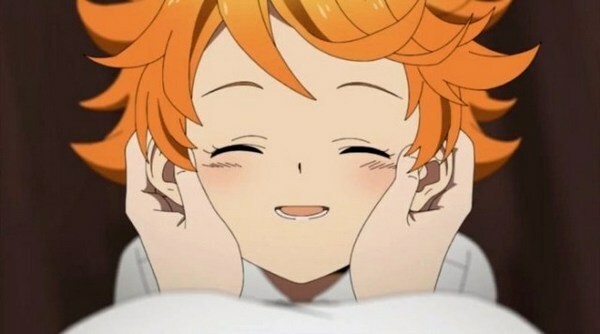 Before we go into any further detail, we have to say this: The Promised Neverland anime is really good! And we say this from both perspectives of people who have and have not read the original manga. The first episode really captured the atmosphere and the goal of the first chapters. At the beginning, we got to see a happy orphanage always fills with joy from the children living in this place. They lived under a great care of their “Mother Isabella”, they had good food, comfort shelter, and they also got good education. It painted out a hopeful, merry-dilly impression, especially for those who do not read the manga. But then story quickly snapped into something completely unexpected even for some of us who have read the manga before. The thing is: this first episode purposefully showed the death of Conny – the girl who supposedly got adopted just like in the manga. It is truly a surprise, not because of this plot-twist, but because we did not think that they would show this gore scene in such clear way. And for anime-only viewer, this scene was totally a blast since it completely reversed the expectation: “This is not a happy slice-of-life anime; this is psychological horror story where children literally become monsters’ food”. Continue to the next two episodes, we continue to sense an intense atmosphere throughout the story. Interesting enough, such intense sensation does not come from any violent scene; instead, it comes from the fear imposing towards Emma, Norman, and Ray. We viewers understand that once these kids’ motives are discovered, they will be dead, period. We do care for Emma and other children. We cannot help but to wonder how these three children can stand up against an adult (who is by-the-way definitely not just some “caretaker”). Then tension continues to rise when a new “apprentice caretaker” named Carol arrived. Despite having no idea about this woman’s background, the three friends, along with we viewers, can clearly sense that this woman potentially means bad news. The stake now only rises higher since the children have to fight not one, but two grown-up adults with shady secrets. In terms of characters, we also think that they are portrayed quite well in this anime version. Mother Isabella looks really kind and caring on the outside, but then she starts to exude a mysterious and terrifying vibe after Emma and Norman discovered the truth. 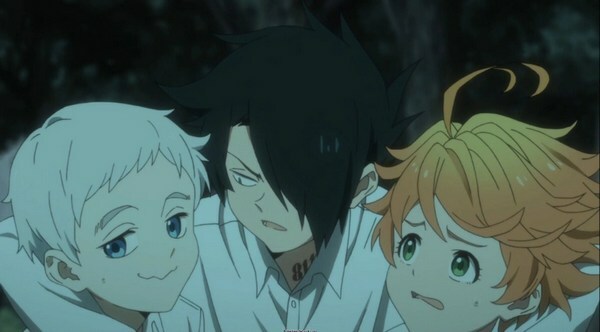 The three “star children” Emma, Norman, and Ray also really shine: Emma is hopeful and compassionate, her emotion especially when she witnessed truth is so convincing and it resonates within the viewers. Both Norman and Ray are equally smart, they look everything around them in more realistic way. Norman seems to be balanced in this regard, while Ray leans more towards more pessimistic way of thinking as he himself proposed that they should escape for themselves and abandon other children. Most of their personalities translate rather well in the anime, which is a good aspect given how character-focused this story is. That being said, many manga-readers probably feel disappointed from this anime adaptation due to how rushed the anime is. For example, some people pointed out that the second episode rushed 4 chapters and skipped one from the manga. This means the anime skipped much information, especially the characters’ monologues. In the manga, those monologues play an extremely important role because they portray the mind-game between the children and Isabella the caretaker. Furthermore, such element was what made the first arc of The Promised Neverland manga great. On the other hand, many other viewers still consider this The Promised Neverland anime adaptation to be good one given its 12-episode limitations. Despite its lack of monologues, the anime still succeeds in other aspects. Overall The Promised Neverland is still arguably a good anime adaptation given its rushed content compared to the manga. 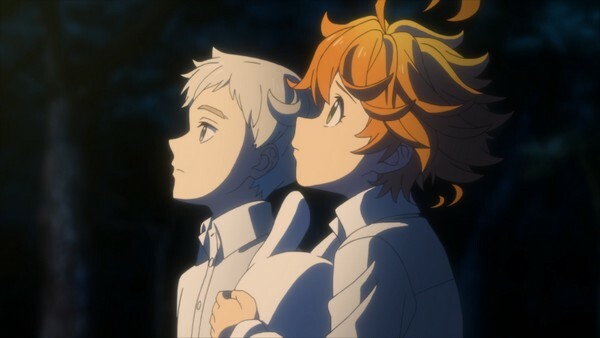 For anime-only viewers, it is possibly one of the best anime this season and for that reason, the current verdict for Yakusoku no Neverland is a positive 8/10. For manga-readers, the opinion can be varied depending on different viewers with different expectations. Then again, there have been only 3 episodes released so far and possibly this anime will get better in later episodes. And for now, thank you and stay tune for more news in the future! Overlord Characters Roster: Behold the Army of Nazarick!